The entire world has been watching as Notre Dame Cathedral in Paris has been burning. 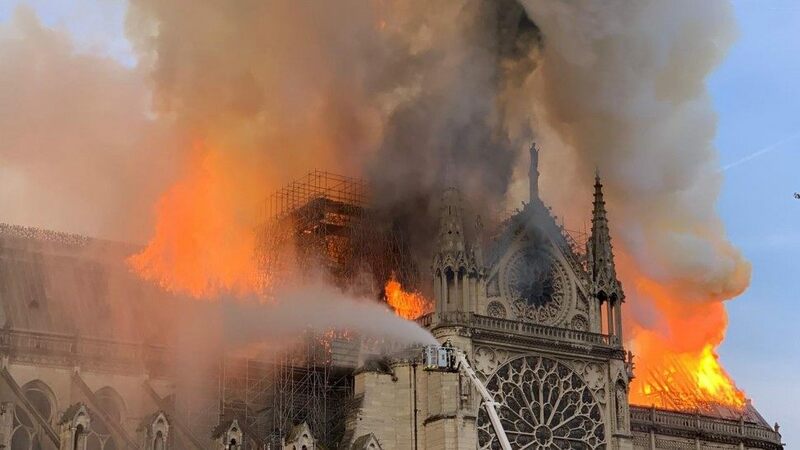 We watched in horror as the famous spire collapsed, and many of us were just as horrified when some media outlets reported that the blaze was caused by an accident or electrical fire related to the ongoing $6.8 million renovation project. Meanwhile, gas tanks and Arabic documents were found in an unmarked car by the Notre-Dame cathedral, sparking fears of terrorism. The horror of this theory comes after a spree of destruction of Catholic churches in France. How can this be simply an accident, when there is an obvious pattern of intentional desecration of France’s holy places? In the past month, Newsweek reports that churches all over the country have been targeted by vandals and arsonists. Vandals have smashed statues, knocked down tabernacles, scattered or destroyed the Eucharist and torn down crosses, sparking fears of a rise in anti-Catholic sentiment in the country. Last Sunday, the historic Church of St. Sulpice in Paris was set on fire just after midday mass on Sunday, Le Parisien reported, although no one was injured. Police are still investigating the attack, which firefighters have confidently attributed to arson. Built in the 17th century, St. Sulpice houses three works by the Romantic painter Eugene de la Croix, and was used in the movie adaptation of The Da Vinci Code, by Dan Brown. And in the southern city of Nimes, near the Spanish border, vandals looted the altar of the church of Notre-Dame des Enfants (Our Lady of the Children) and smeared a cross with human excrement. . .
On February 9, the altar at the church of Notre-Dame in Dijon, the capital of the Burgundy region, was also broken into. The hosts were taken from the tabernacle, which adorns the altar at the front of the church, and scattered on the ground. . . The Catholic News Service noted ten vandalisms in February and March of this year alone. This current blaze even garnered the urgent attention of Donald Trump. But back to my questions about the earlier string of fires and the lack of coverage. In my experience, fires were always a thing because they generally produced good art. Flames shooting from a window, whether a still photograph or video, was always a major reason editors put these incidents on their story budgets. In the case of the French churches, however, the photos tell only a small part of the story. I recall covering several church fires in New York City during my time as a general assignment reporter, one in February 1999 just days before Ash Wednesday and another in March 2002. In the case of the second blaze, no one was hurt and it ultimately proved to be an electrical fire. Nonetheless, sacred relics were destroyed in the process. That it happened during Lent had made it that much worse for worshippers — and certainly a news story. Fast-forward to present-day France. Crux was one of the first English-language Catholic news outlets to cover the phenomenon on March 28. 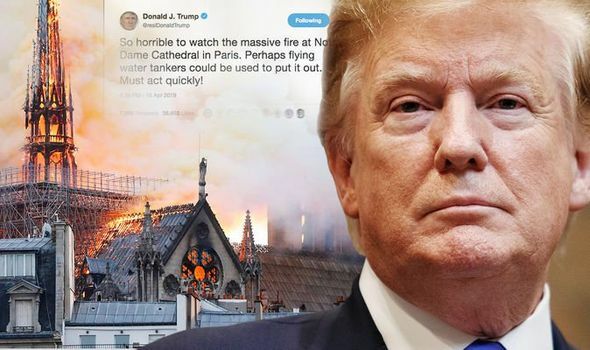 While the article was accompanied by flames shooting through the front door of St. Sulpice Church in Paris, it wasn’t the reason why they wrote about it. It’s worth noting that St. Sulpice is a baroque church completed in 1870. It is also the city’s second-largest church, behind Notre Dame, and used in the movie version of The Da Vinci Code. Vandals and arsonists have targeted French churches in a wave of attacks that has lasted nearly two months. Investigators confirmed March 18 that the fire was started deliberately, according to the website of the Vienna-based Observatory on Intolerance and Discrimination Against Christians in Europe, an independent organization founded with the help of the Council of European Bishops’ Conferences. Utter the words “France” and “Catholicism” in the same breath and you immediately get statements such as, “No one in France goes to church anymore.” While it is true that France ranks near the bottom of countries in the world where regular church attendance is low. While Pew Research found that 64% identified as Christians in 2018, only 18% attend services regularly in some of the same places that have been recently vandalized. It took me a simple Google search to find this information. Furthermore, a very good piece in America magazine posted to its website in April 2018 alluded to a French Catholic renaissance. The essay looked at how faith and politics influenced the country’s presidential elections the year before. Could these heinous acts have a political connection? More on that later. A recent fire at St. Sulpice, the second-largest church in Paris, has shed light on a trend that has become commonplace in many smaller towns. “Who has heard of the sacking of the monastery of Saint Jean des Balmes in Aveyron? Of those teenagers who urinated into the holy water font of the church at Villeneuve de Berg in Ardèche?” the Paris daily Le Figaro asked last week in an article highlighting some of the lesser-known profanations around the country this month. Incidents such as these get a brief mention in the press, complete with quotes from Catholics shocked at the sight of scattered hosts or beheaded statues, and sometimes a short video clip on national television. Other wire services, such as Reuters, wrote about the St. Sulpice fire. So did Newsweek, which was one of the first U.S. outlets to do so. That’s largely it. In England, The Daily Express, a tabloid newspaper, published a story on March 20 detailing the phenomenon. In Russia, RT’s English-language site also made a point of covering it. The American press in particular has been negligent on this one. In fact, one of the first websites to write about the incidents for American audiences was Breitbart. Did coverage on the politically conservative site dated March 20 suddenly make this a right-wing story? It shouldn’t have. Vandalism, no matter who the potential culprits are, should be reported by journalists. Is there a conservative or liberal way to cover a fire? I never thought so — until now. In 2018, the Ministry of the Interior recorded 541 anti-Semitic acts, 100 anti-Muslim acts, and 1,063 anti-Christian acts. Even with the RNS story out there for media subscribers to use, the only major media outlet to run the story on its website was The Washington Post. There was, for example, no New York Times story (just to name one of the largest newspapers in the English-speaking world) until Monday’s Notre Dame disaster. It’s hard to believe that a rash of fires tied to vandals isn’t of interest to one of the world’s largest news organizations with a bureau in the French capitol. Why? Would this rash of sacrilegious attacks have enjoyed more coverage had they occurred in synagogues or mosques? It’s hard to say. After all, the string of fires at black churches in Louisiana has warranted — and deservingly so — lots of media attention. On this series of fires, culminating with the arrest of a suspect on April 10, The New York Times did a solid job. “I think there is a rising hostility in France against the church and its symbols,” but “it seems to be more against Christianity and the symbols of Christianity. Hey Buddy!, I found this information for you: "Christian Persecution: As Western Holy Week begins, Catholic churches in France are targeted". Here is the website link: https://russophile.org/christian-persecution-as-western-holy-week-begins-catholic-churches-in-france-are-targeted/. Thank you.